Manufactured on the PzKpfw 38(t) chassis from 1943 through 1944, with several interruptions in production and a total of 282 vehicles completed. The Grille has weak armor, is rather sluggish, and the stock gun only has a short range, but once upgraded to the 15 cm sFH 13 L/17 gun, it gains a lot of firepower with the benefit of having an increased HE damage that can destroy or easily cripple any tank that it fires at. Many players tend to keep the Grille in their garage even after upgrading to the Hummel, since it's often required in medium tank companies. The Grille starts off as a low damage SPG with high RoF. Getting the larger gun, however, changes its play style completely. Compared to other lower tier SPG's, the Grille is where you start to see a massive increase in alpha damage. Direct hits are lethal to light tanks, TD's, mediums, and other SPG's if you can only land them. Heavy tanks will also suffer greatly from a direct impact, often losing a large percentage of their health as well as a module or two. Of course if you miss you won't do any damage better than 80 HP. The Grille does not reflect on the German SPG philosophy in terms of accuracy, but its still more accurate than other nations SPG´s. The Grille's high damage can make it an effective TD or scout destroyer, though it lacks the turning radius for close-quarters combat. Also, when taking shots from enemy tanks, the first module in the line of fire is the engine, and getting forced to stop due to engine damage is not uncommon, which combined with pathetic gun traversal arc means swift death. Let your allies handle dogfight with immediate threats that keep moving around, while you pick out all the distant campers. You can do more harm than good with your sluggish slugs in a rapid melee. One of the steepest trajectories in the German artillery allows you reach enemies hidden behind obstacles they believe completely safe. Recheck old "hopeless" spots, some of them are within your reach now! 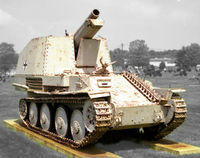 Good crew becomes essential because the difference in aim and reload times between good and poor crew make or break the usability of this SPG. Modules like Shell Rammer and GLD are immensely useful too and with massive damage dealt to heavies resulting in much better financial income your budget should afford them rather quickly.